I was wearing my 8 month-old son Harrison. We were with my husband, our 2.5 year-old daughter and a few good friends, one of whom took this pic during a mini vacation to the shore. 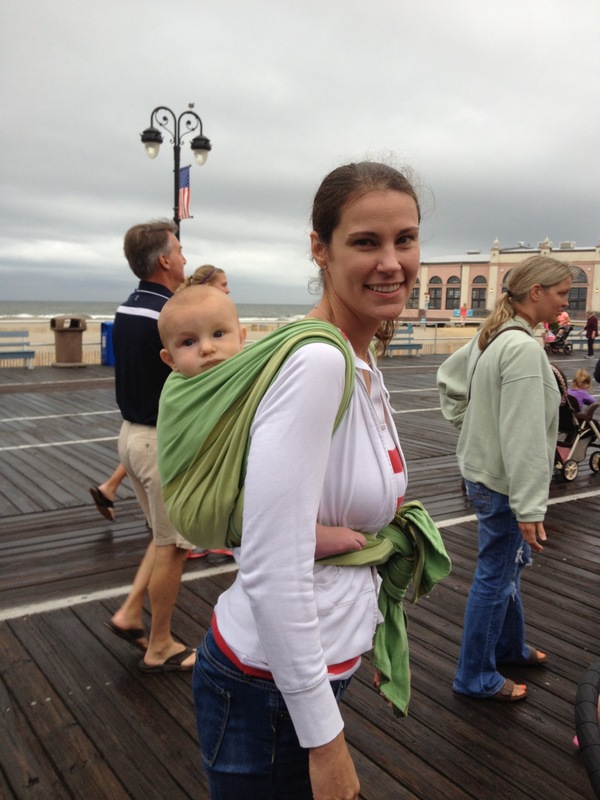 We were on the boardwalk in Ocean City, NJ. My husband and I both vacationed there every summer as children. Perhaps we even played side-by-side on the sand or waited in line together for the Ferris Wheel and never knew. This is the first time we were there together with our own children and were so excited by memories of our childhood vacations and by creating new ones with our family. Harrison is wrappped on my back in a ruck using a Dolcino Bali woven wrap. The evening of August 1st 2013. Babywearing is an essential part of my parenting routine (baby is sleeping on my back as I type this), especially since Harrison was born, as it lets me meet his needs for closeness, comfort, and security while allowing me to have my hands free to care for and play with his big sister Alexandra. On this particular night, little Harrison was exhausted after going the entire day without a nap. He is a quiet but curious baby, and his need to soak up all the sights and sounds of this new place would not allow him to sleep. I had worn him much of the day (even through a beeline home from the beach to escape a rainstorm) and although his little body must have been exhausted, he was able to participate happily in our activities, even into the late evening. Our wrap kept him warm and cozy on a cold, damp night. It kept him snuggled up close to his mama, where he felt calm and secure. It allowed all of us to enjoy pizza at Mack & Manco’s, ice cream at Kohr Bros, rides at Wonderland Pier, and making memories together as a family that did not include the stress of trying to care for a tired, fussy, crying baby. He was calm and content because he was exactly where he needed to be.